Illustrate the numbers from 1 to 10. 15 houses with 1 to 5 holes for the plugs and 1 house with no hole for zero. 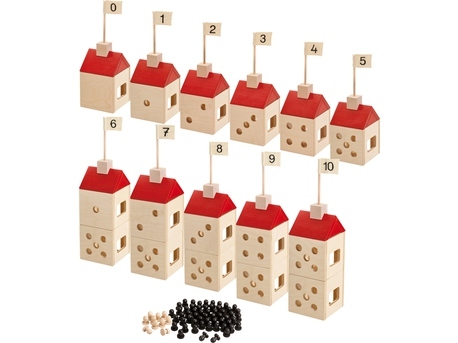 The numbers 6 to 10 are shown by stacking or placing two houses next to each other (5 + 1, 5 + 2, 5 + 3 etc.) Note: The numbers after 6 can also be depicted as duplexes if you order 5 additional roofs. 16 houses (13 x 13 x 13 cm), 11 roofs (height: 7 cm), 11 chimneys, 11 flags, 55 black pegs, 10 natural-color pegs. Material: wood, all edges are rounded, flags made of fabric.